BlackTravels.com Blog: Seeking Black Travel Bloggers! It's so strange. I've been scouring Blogger for other blogs by Black Travelers and oddly enough I haven't really been that successful, so I'm calling on you for help. If you're a Black Traveler with a blog, or you regularly read a blog that would be of interest to black travelers, why not send me a link? 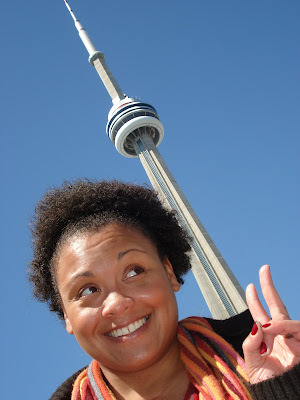 Goofing around by the Toronto Space needle. May 2007. For 2007 my goal is to connect to more Black Travel bloggers and to add them to this blogs blog roll. So let's get started! Feel free to post your links in comments or drop me an e-mail at info@blacktravels.com. Don't be shy. I love to hear from people to drop my the BlackTravels.com website and blog. And in the meantime, Happy Holidays and Happy Travels! My husband and I started an black heritage blog over a year ago and are still at it. Its called Discover Black Heritage. I've added you to our blogroll. 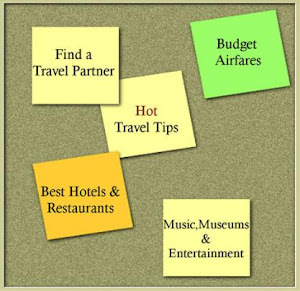 This is my first time visiting your blog, although I have surfed your other sites in the past.....yahoo groups and travel.com. I will see if I can think of any other blogs that fit the bill. You're right...they are definitely few and far between, which is quiet surprising and frustrating at times. HI! I'm going to send you an email, because I love your site, ( just found it) but I am/ have been on a travel journey with my four sisters for about five months now, shooting a documentary. Our blog is at thepeoplecouldfly.blogspot.com. It is themed after an American folktale about Africans who fly. Thanks for this beautiful site you have going. You're looking for black travel bloggers? What a coincidence -- so am I. And a lot of them are now on my blogroll...as you already are! Come on in, have a look around. Fellow travelers are always welcome! Hello. This is beautiful to discover other Black travellers. I'm of Jamaican descent , but live in London and love travelling. I've only just latched onto this blogging.